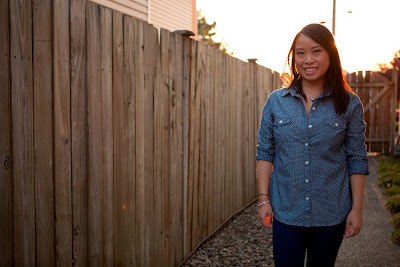 I found this really cute polka dot chambray top at Old Navy during one of their on-line sales and was able to score this for only $17 + free shipping (thank you Banana Luxe card)! What a deal right?? I love how versatile this button-up can be by dressing it up or down. I should've gotten a size smaller though because it was a tad loose around the arms and body. Oh well.. either way it is definitely comfy to wear with a pair of skinnies and heels or even with some shorts and sandals (before Fall/Autumn crisp weather hits). Don't forget to enter into my DSK Necklace Giveaway HERE! Only 3 more days left! love the mix of blue and white polka dots with red :) such a retro feel! This is really a cute shirt and $17 was def a steal. It sold out in record time at the Old Navy in Downtown, and I did see a few at F21 but they're now gone! its a cute look. i just have two fashion advices for you: try to emphasize the smallest part of your waist (by belting the top you're wearing for example) and buy pointed shoes so it makes u seem taller. Loving the red shoes pop!! You look so charming when you're smiling.! Cute outfit! I really like the shirt, polkadots are so cute! Lovely shirt! I also fell for a chambray shirt, slightly different of yours, which I was wearing yesterday. I'll show it in my next post, stay tuned! Cute polka dot shirt with a touch of sass in those red peep toe shoes! I love the light in your pictures, truly gorgeous and those patent red shoes are too cute <3 Would you like to follow each other? love that old navy top! have debated on getting it several times! looks great paired with the red! a very nice comfy look!!!! a very gorgeous and comfortable looking outfit!! I love chambray shirts, and your shoes are adorable. Red is a great statement color. Fall. The air smells so good! I love chambray! And with polka dots, it's even better! I wait you on my blog! Drooling over that polka dot top. SO perfect! I super love the polka dot top!! Plus the shoes look amazing with it!! 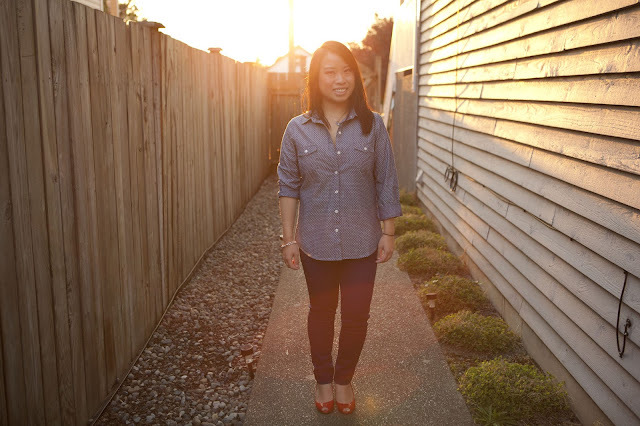 Love that polka dot chambray and your red heels are super cute! "International Directory Blogspot" is made of thousend of blogs from 155 countries. If you join us and follow our blog, you will have many more visitors. you look lovely! great casual look! I love your shoes and shirt so much (I can not even decide upon which item is better)! P.S. you are lovely indeed so I became your follower! please check out my blog as well. and good luck with your blog, it's a great place! Cute! I couldn't tell that there were polka-dots on your top until I saw the closet up... I love that!! :) And your red shoes are adorable. Nice outfit!! I love those shoes!!! Since I work at Levi's, i have a soft spot for all things denim and all things chambray. That is our uniform at the office actually! However, this polka dot number is so cute! Can't believe it's from Old Navy! Shoes is perfect with your top! thank you so much dear! I am now following you too on GFC!! :) keep in touch! ah. don't remind me! i'm def not looking forward to those super short days of light... you know the ones where you wake up it's dark and you come home from work and it's dark. lol. i love those kitten heels. so perfect to wear during pregnancy! Love your blog, following u now! This shirt is just too cute!! Love the polka dots :) I am your newest follower and would love to follow each other! wahh love this.. the chambray w/ the bright red shoes is so pin-up hahah.. reminds me of bridget bardot!! you look super cute hon! Lovely shirt!! I love polka dots,the necklace is so cute. Thank you so much for stopping by my blog and and leaving a comment!!! I've followed your blog on GFC and Bloglovin. Hope you followed mine if you enjoyed your visit!! Great look! Very trendy polkadot blouse doll! 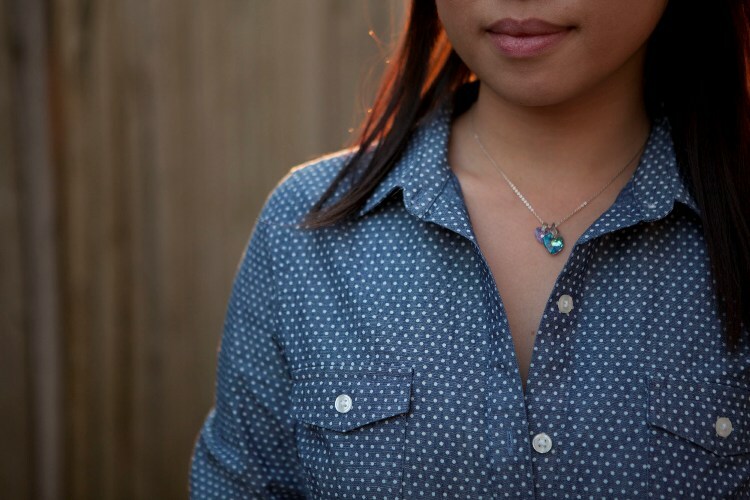 i love that dotted chambray shirt! I love your red shoes! I was thinking of getting myself a pair of red heels, yours are so cute. Sweet look. 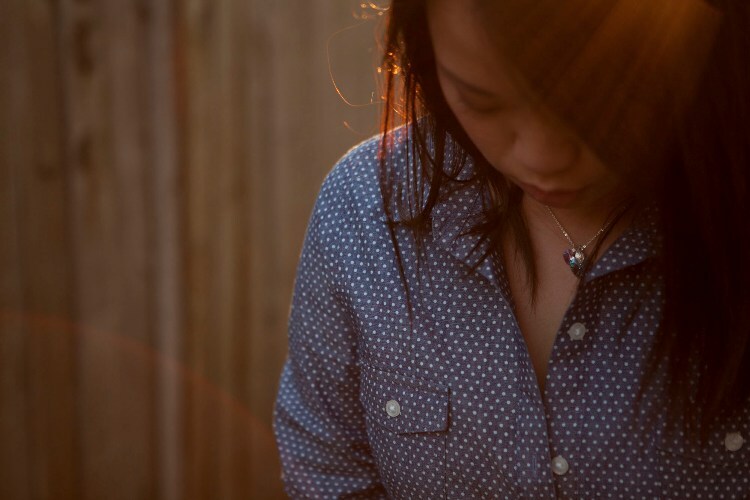 I adore that chambray shirt! Can't go wrong with chambray! 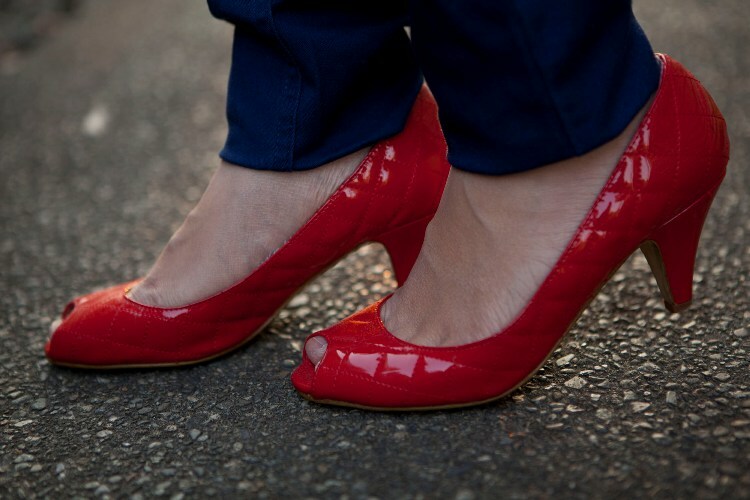 Love the red heels and chambray! You are lovely! Love the way the pictures are taken during sunset! And ofcourse u look amazing!! Love the pop of red. You look beautiful! P.S. : follow you... Let's follow each other? Thanks for dropping by my blog n commenting. Do drop by often. I'd love your visits n comments! Do follow and like by GFC & FB if you like and let me know with a comment. I would be very glad to have you as my new friend, too. The light is so perfect!! Stunning!! loving the pop of colour with your the red shoes to your casual outfit. Would you like to follow each other? Let me know and we'll follow back. I love your polka dot shirt. The red shoes really make this outfit pop! 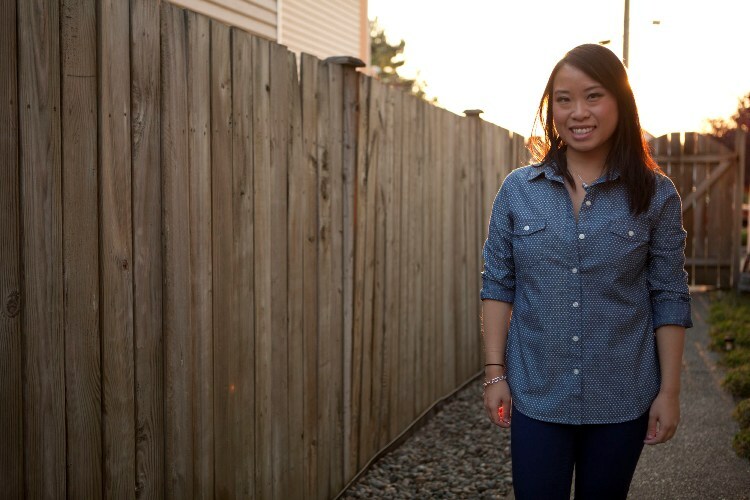 Chambray, my favorite kind of shirt! really its nice blog .i am going to follow to u ..
Love the button-up. I almost bought it, but decided against it... totally regret that now. SFW: Classy Purple + DSK Winner! **CLOSED** Last Day for DSK Giveaway!! **CLOSED** 100 Followers + DSK Giveaway! !